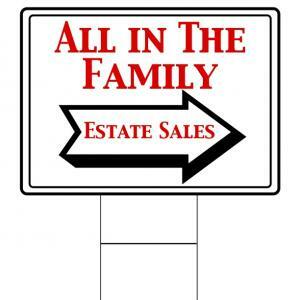 All in the Family Estate Sales is an estate sale company serving the Pewaukee, WI area. Menomonee Falls Estate Sale-Quality Stuff!! South Milwaukee Estate Sale-Tons of fun stuff! West Bend Estate Sale-Ground Control to Major Tom!!!! Fill a Bag for $5 or 75% off larger items!!!!!! Its all gotta go!!!!! TONS OF STUFF IN EAST TROY!!!!! Lots of Nice Stuff in Sussex!!! Fill A Bag for $5-South Milwaukee-ONE DAY ONLY!!!! Fill a Bag for $5 or 75% off larger items!!! TONS O' FUN IN SOUTH MILWAUKEE!!! Menomonee Falls Downsizing Sale-Hummels,Collector Plates,Beam and More! Elm Grove Sale-Lladro,Hummels,Primitives,Toys, Crocks and even PO Boxes!!!! Hamms Lighted sihn,nice dresser set,end tables,coffee table,misc kitchen gadgets,linens, blankets,tools,carts,desks,holiday decor,sewing machines and much more!! 10am-2pm Tuesday March 24th 3209 s 57th st. Whatever you can stuff in a bag for $5. Larger items at deeper discounts. some items excluded. This company has posted a total of 56 estate sales. Only the most recent 50 sales are shown.